And it hit me—on day one—that for once my default response was 100% true. It wasn’t a sarcastic response at al. All of us thru-hikers are living our dream of hiking the Appalachian Trail. Just admiring all the beauty. The white on the ground is tiny little flowers. The first two weeks have been amazing—lots of great weather and good hiking. I have been incredibly fortunate to have a bunch of beautiful days to hike. Had rain on a couple of nights, a dusting of snow one morning while hiking, some cold nights, but nothing horrible yet. And actually, I have somehow managed to dodge rain a couple times. Additionally, I met a hiking partner late on day three. 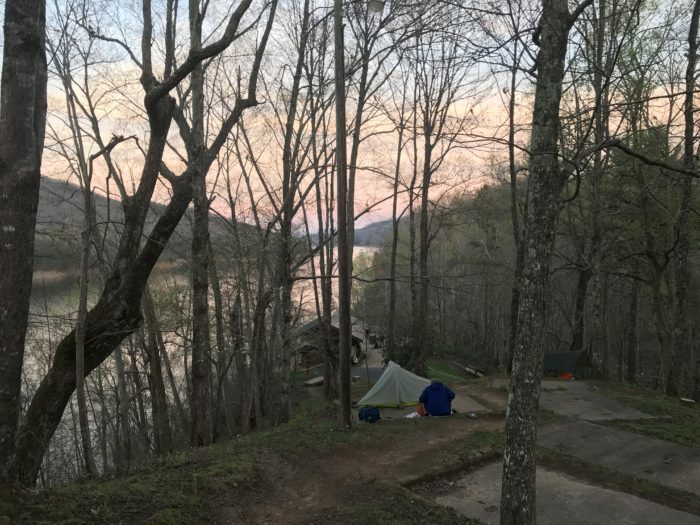 It’s still early, but we have been on the same wavelength so far on how many miles we hike, when to resupply, and when to stay in town. We don’t always hike together, but have been ending up at the same camps. When we do hike together, we have a good bit in common, so conversation has been easy. He’s finally accepted a trail name, Orange Crush, but I think we are going to call him O.C. It has often been the little things on the trail that change the mood the most. The one that stands out the most was one morning it was freezing as I got up—coldest morning yet. 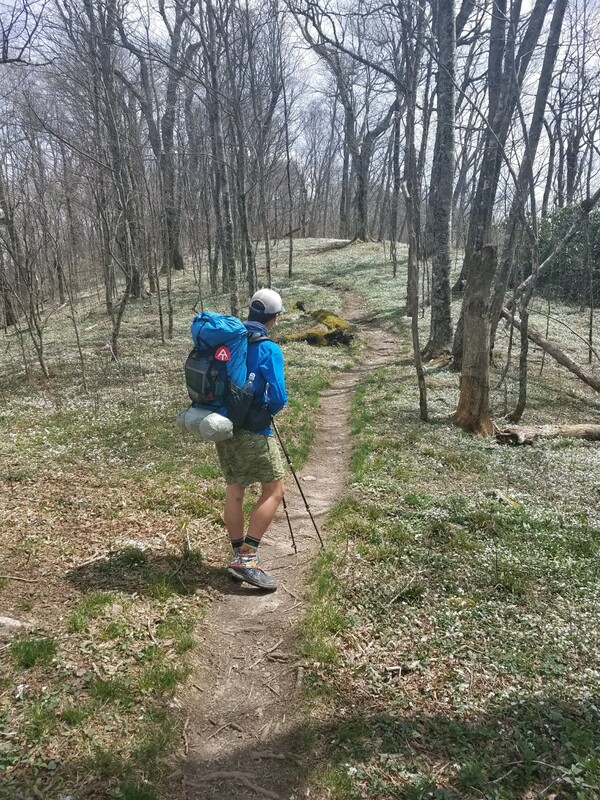 I stretched, ate a little food, and packed up in a hurry so I could get hiking (it warms you up!). After 30 minutes of hiking I turned one corner on the trail and the glorious sun illuminated the mountain and the temperate was ten degrees higher. Another hiker was right in front of me and mentioned it’s “just the little things.” And he couldn’t have been more right. Another great example is just the camaraderie with all the hikers. Everyone has been super excited and very friendly. The only thing I can compare it to is the first week of college—when everyone wants to meet new friends and everyone is just excited and happy. All the cool and inspirational people out here make the experience even more special. Many people back home have been waiting for me to get a trail name, and it took a week and a half to get one—not super fast, not super slow. But before I give away my new name, I need to explain hiker boxes. Hiker boxes are at most hostels and outfitters, and it just a big box with food and gear dumped by hikers who didn’t need it anymore. It then becomes free game for anyone to pick up and carry on down the trail. 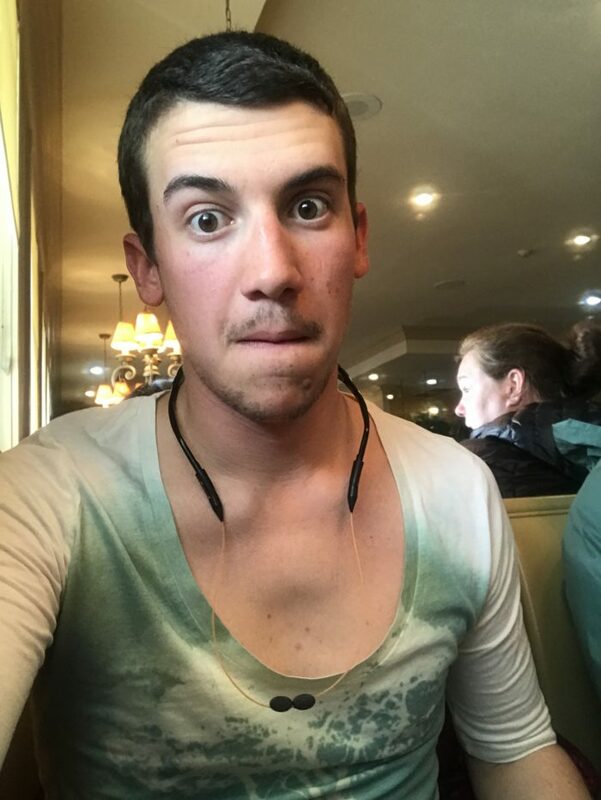 At our first town stop, with most my clothes in the washing machine, I found a super deep V-neck shirt in the hiker box. Being hiker trash, I just had to wear it into town. Of course I look stunning in the shirt and get all sorts of stares from the townspeople. 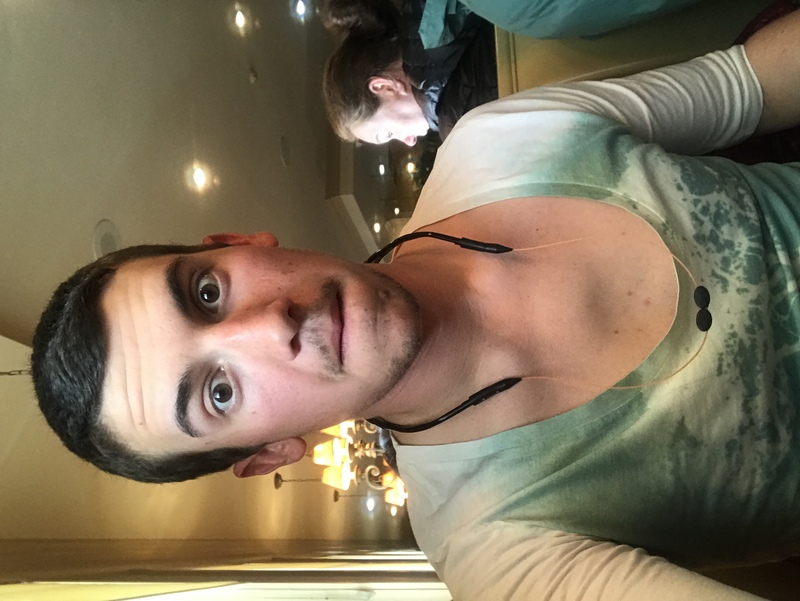 After such a good experience, and since the shirt didn’t weigh much, I packed out the shirt and have been wearing it at camp at night and also in town. Finally, two different groups of people named me Blouse on the same day. You can’t say no to that many people. Look at the pic below and see if you agree. The day I found my shirt! The funny face was for my friends who were getting live updates. So if you see me on trail, say, “Hello, Blouse.” Happy trails. Most dogs petted in a day on trail: Five (twice). Zero dogs petted: two days. 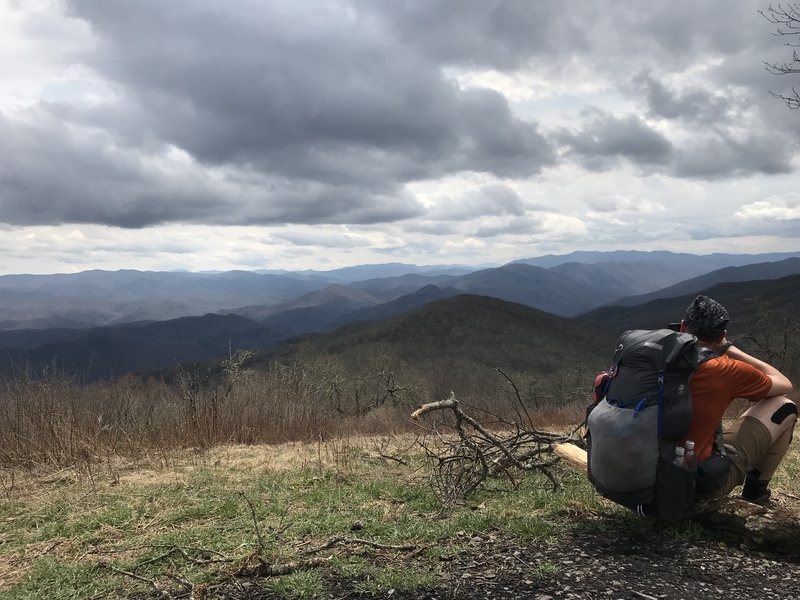 Attempting a NOBO thru-hike of the AT in 2019. Born and raised in South Carolina. Three years after graduating with an engineering degree, it is time to put the career on hold and chase a dream. I promise to be honest, attempt to be funny, bring up fishing more than once, and hopefully pet some dogs along the way. Isaac, love the hiking tables keep posting! Wishing you an incredible journey!